We’ve updated our Etsy plugin recently with improvements regarding the bulk product upload, product variation support, multiple image support for individual products and more. 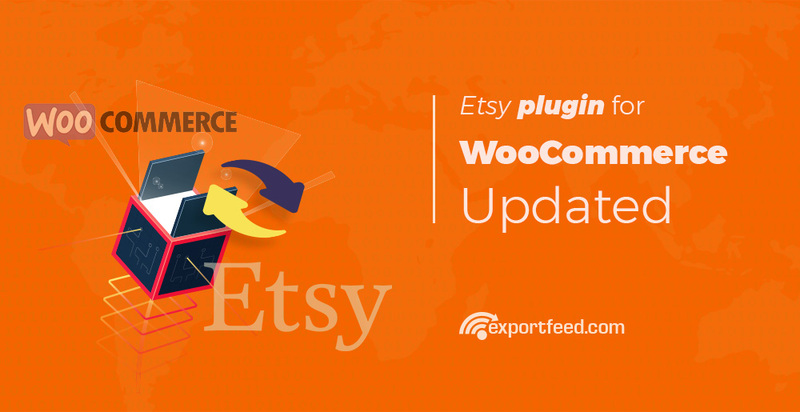 ExportFeed plugin still stands as the complete tool for Etsy bulk upload and create your WooCommerce product listings to sell more products through Etsy marketplace. Before going in to the details of what we’ve changed with this version of the Etsy plugin, let’s first recap the most important reasons why Etsy is such an amazing marketplace to sell your products. It’s the only popular marketplace which allows you to create listing for your handmade and antique products. This marketplace allows you to create your storefront and list your products. It also allows you to improve the goodwill of your brand among thousands of customers. This is the only marketplace which will allow you to get registered as a seller for free. It also lists your products for a nominal cost of $0.2 per listing and keep your listings live till the products are sold and charges you some transaction fee. Listing your WooCommerce products to Etsy can be one of the most profitable actions. Given that, your products are acceptable in this marketplace… Wait! Etsy has now opened up for other products also. So you can send most of your WooCommerce products to Etsy and grab more sales from this marketplace. We’ve improved this and related functions for Etsy bulk upload feature in this latest release. When you have multiple options to offer to your customers for the same products – meaning variations of the products, why limit them on Etsy listing. Though Etsy has not allowed full-fledged product variation listing, we have stretched the allowed API connection to the limit. This version release of our WooCommerce Etsy plugin allows you to create product feed while including values for up to 2 product variations. Needless to say, a picture can tell thousands of stories better than words. However, the product images listing on high performing marketplaces have to follow the rules set by these marketplaces. Luckily, Etsy allows up to 9 images for each individual product listing. Though previous version release also allowed you to enjoy the product image upload to Etsy, there were some changes in the format of sending product image URL. This has been addressed in this version release. We’ve also made some minor behind-the-curtain changes on this version of the plugin which will help to increase the speed and product list creation process. These changes might go unnoticed when using the plugin for few products but will have tremendous impact for Etsy bulk products upload. If you haven’t started to sell your products on Etsy marketplace and looking for a perfect tool for WooCommerce Etsy integration, here’s the link of our updated plugin. Start WooCommerce to Etsy Bulk Upload Now!